Author: Howard B. Rand LL.B. 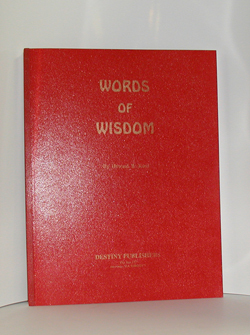 Words of Wisdom is an inspirational book for the present times. Each Feature Article was originally published in Destiny Magazine which ceased publication in the year 1968. It is truly a collection of words of wisdom and truth of significant import from the Scriptures just as timely today as when first written. Words of Wisdom is a sequel to the book Gems of Truth by Mr. Rand long an inspirational favorite of many. Words of Wisdom will make an excellent gift to young or old for any occasion.